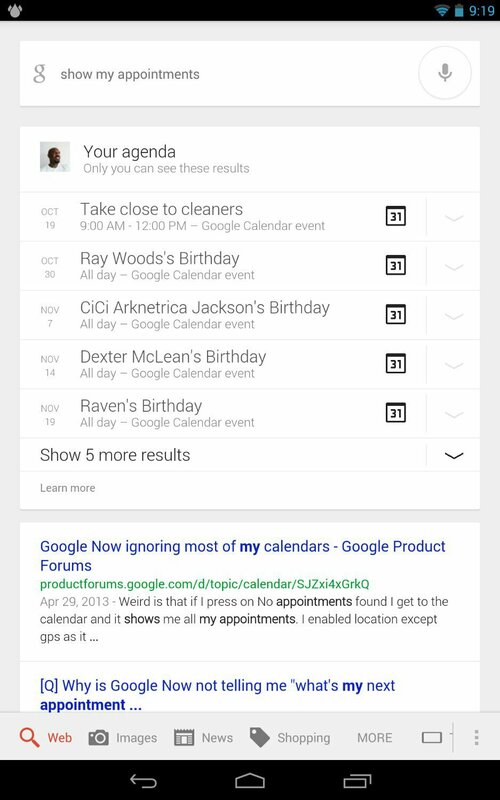 Google Now - Show me appointments for this week and similar requests - is it possible? On my iPhone using Siri I can say, "Show me appointments for this week" and it will reply with "Ok, I found six appointments for this week:" and then list them. But with Google Now if I make the same request I just get some web page results. It's the same Google calendar. Does Google Now have Siri-like ability to answer requests like that? Not quite the same but you can ask plans for a specific day. I asked for the week and that didn't work. "Just ask “what are my plans for tomorrow?” or “when is my next meeting with Sally?” to get your appointments and events info. One quick search and your plans are right at your fingertips." What are my plans for tomorrow? What are my appointments for next week? When is my next dentist appointment? But all it does is return web pages with those keywords. No information at all from my Nexus data itself. "Show me my Appointment" showed me the next 4 appointment on my calender. but when you ask it for the first time it will prompt to accept that Google now is getting the calender info. It just shows me a page of web search results if I say that. I get web results as well on HTC One. How do you disable the web results? I did find one appointment-related command which works. If I say, "What is my next appointment" it will show me the next appointment on my calendar, with a link to view the calendar. So it is capable of getting to the calendar and retrieving info from it. The question is what commands are available to access it? Today is the 14th...I said "Show me my appointment" and after accepting the calendar setting, it shows everything through the 20th for me. We all seem to be getting different results and having different experiences. If I say "Show me my appointment" it just brings up web pages. "Show me my calendar" showed events through January, granted I don't have a ton if stuff in it. That particular command tries to take me to the web version of Google calendar instead of opening up my calendar. I can just open up my calendar with the voice command, "Open calendar." Just below that it lists my events. Reading this I'm curious if it may have to do with the defautl settings for 'what' opens the calendar. Similar to how you can set the default to either open a youtube video in a browser or the youtube app and select it to do this once or every time. Don't know. But I don't have any alternative Calendar apps installed. Just the native one. And it does recognize "What is my next appointment" and shows me that from my calendar. It just doesn't work with all those other commands. This is what I get. Are you saying this is not what you want because it's the web version or you don't even get this? I just get web search results with those other questions. Is your calendar synced to Gmail? If you are, I got nothing else since you say you are not using 3rd party calendar. I think it must be synced, because if I ask, "What is my next appointment" it correctly displays the next appointment from my calendar. I just can't get any other verbal calendar question answered. Maybe clear the cache on Google search/now or something? Perhaps you answered no by mistake when it prompted? Answered no by mistake when it prompted for what? Remember - it does have access to my calendar since it will correctly show me my next appointment in response to the voice command, "What is my next appointment?" I give up...regional thing? Aren't you in Japan? Yes, I'm in Japan. Doesn't quite sound like a regional thing though. The very first time I think it asked if it could access the calendar.